There is no doubt that compact fluorescent lamps (CFLs) are more energy efficient than their predecessors, incandescent light bulbs. But the issue of their mercury content ending up in landfills is very real. The Australian Government’s FluoroCycle scheme is a voluntary system supporting industry in recycling fluorescent lights, thereby keeping mercury pollution from entering the environment. It is estimated that 95% of lights containing mercury end up in landfill each year, in Australia,. The Sydney Opera House was one of several organisations presented with a certificate by Senator Don Farrell, Parliamentary Secretary for Sustainability and Urban Water, in Sydney recently. There are 135 organisations nationally that have signed up for the scheme to date, and Senator Farrell took the opportunity of the presentation to urge more to do the same. “Joining FluoroCycle is an ideal way for businesses to do something practical to help the environment,” he said. We might hope that it’s not the only thing they do however! 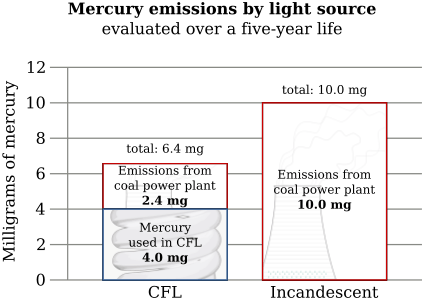 It is worth noting that although the responsibility for safe mercury disposal now rests with the consumer in Australia (since incandescent light bulbs are not available for regular lighting use any more), the total mercury pollution from CFLs is lower than that of incandescent lights, if the electricity used to power them is from coal-fired power stations. And that describes 74% of electricity used in Australia at present (source). Image by Benjamin D. Esham, used under a Creative Commons attribution & share alike license.